Joyful and activity-based environment in schools increases quality of education and substantially decreases the dropout rates. This was revealed in the findings of a pilot project titled ‘Reaching all Children in Education (RACE)’ implemented by Campaign for Popular Education (CAMPE) with financial support from PKSF. A presentation was made on the outcomes of RACE project that was in place from July to December 2019. The event was organized at PKSF auditorium on 24 January 2019. International Day of Education was also observed in view of this occasion. Eminent economist and Chairman of PKSF Dr Qazi Kholiquzzaman Ahmad attended as the Chief Guest of the event while Ms Rasheda K Chowdhury, Executive Director, CAMPE presided over it. Mr Md Abdul Karim, Managing Director, PKSF and Dr Md Helal Uddin, Director, NGO Affairs Bureau were also present at the ceremony as special guests. Dr Ahmad, in his speech, expressed satisfaction regarding the project and said that he would like to explore the possibilities of integrating the outcomes of RACE project into ENRICH education services. Quality of primary education must be ensured, he added. 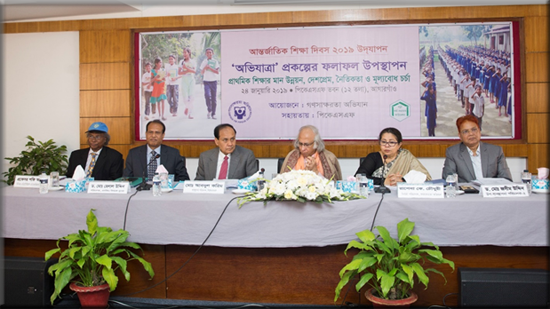 Ms Chowdhury thanked PKSF and the Partner Organizations for their cooperation. Mr Karim remarked on how the lessons of the pilot project could be combined with the ENRICH interventions. Professor Shafi Ahmed, Senior Editorial Advisor, PKSF spoke about his field-level observations. He said, RACE needed to be taken forward. He emphasized on the efficient role of the teachers. Dr Md Helal Uddin spoke highly about the project and requested the NGOs to try to increase remuneration of the teachers employed in their education related projects. Dr Md Jashim Uddin, Deputy Managing Director, PKSF delivered the welcome speech and spoke about the inception of the project. Mr K.M. Enamul Hoque, Deputy Director, Research, CAMPE presented the outcomes of RACE project. He mentioned that the project was a combined effort of 17 Partner Organizations in 21 Unions of 12 districts. It included students of class III to V of 300 Government Primary Schools. He mentioned that a series of education fairs were arranged at the end of the project in 21 Unions. More than 10 thousand students and teachers took part in those fairs. Many participants shared their views and observations in the open floor session.